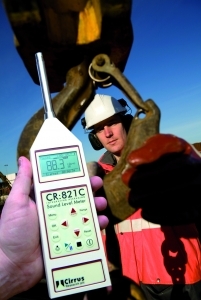 Cirrus Research plc, the UK company which specialises in the design and development of noise measurement equipment, is offering a simple and comprehensive option for noise at work and environmental noise monitoring solutions; the CK:821C Sound Level Meter Kit. Designed, manufactured and supported in the UK, these kits are easy to use and are supplied with everything required for most noise measuring applications. Each kit is supplied with a CR:812C Sound level meter, a calibrator, windshield, licence-free Deaf Defier3 software and manuals, as well as Cirrus’ industry leading 2-12 year guarantee. This enables Cirrus’ standard 2 year warranty to be extended by 10 years, at no additional cost, provided that the instrument is serviced and recalibrated annually by either Cirrus Research plc or by an authorised service centre. An optional weatherproof kit is also available, which enables the sound level meter to be used outdoors for up to seven days. The CR:821C Sound Level Meter is available in Class 1 accuracy and complies with the latest IEC 61672 measurement standard as well as IEC 60651 and IEC 60804. Data logging of up to 1300 measurements is now possible, and outdoor measurement kits are available for unattended environmental noise monitoring with remote access via an optional outdoor measurement kit and GSM modem. Other features of the CR:821C include data download to a PC via a USB connection and free lifetime updates to the Deaf Defier3 software. The meter also includes 1:1 Octave Band Filters, which support the selection of hearing protection (PPE), using Cirrus’ Deaf Defier3 software which is supplied as standard.